The greatest expression of God’s love for you and me is shown through the cross, and the redemptive work of Jesus is the heart of our story. The more fully we understand what God has done for us through the cross, and the more completely we put our faith in Jesus and orient our lives toward Him, the greater the freedom in which we will live. Church is not a collection of perfect people – it’s a hospital for the walking wounded! The greatest invitation of your life is the one to be a part of the Church of Jesus Christ! Being a true Christ-follower will not diminish you, but transform you! Today with Allen Jackson A daily devotional from Pastor Allen Jackson. 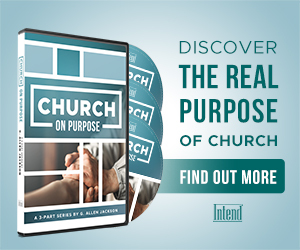 Allen Jackson is passionate about helping people become Christ-followers who “respond to God’s invitations for their life.” He has served World Outreach Church in Murfreesboro, Tennessee as senior pastor since 1989. Under his leadership, the fellowship has grown to a congregation of over 10,000. Pastor Allen’s messages are broadcast via television to over 25 million households and stream over the Internet to 139 countries. Through Intend Ministries, he coaches pastors and publishes small-group curriculum. Pastor Allen holds degrees from Oral Roberts University and Vanderbilt University and has studied at Gordon-Conwell Theological Seminary and Hebrew University of Jerusalem.